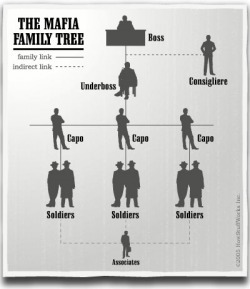 Each regional Mafia is made up of various Families or gangs. The no. may range from a few to over a 100 depending upon the region. Each Family has separate business dealings and tend to stay out of each other's way. But sometimes their business enterprises may intermingle with each other to a very large extent, depending upon their proximity to each other and the nature of the business. The Mafia had a very effective structure. It prevented the higher-ranked members of the Families to be responsible for the criminal enterprises. And any lower-ranked Mafioso could easily be bailed out of jail by cleaning his record and bribing the judges. The cops were also generally of the Mafia's payroll and "looked the other way" whenever the Mafia were involved. 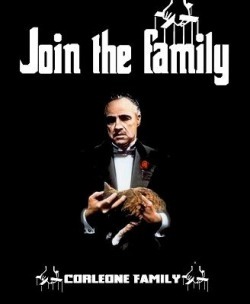 There is a position between the Don and the Underboss too - The Consigliere. He acts like an adviser to the Don and is supposed to make impartial decisions based upon fairness and for the good of the Mafia, rather thank on personal vendettas. This p[position is generally appointed by the Don but sometimes it is also elected by members of the Mafia. The Consigliere also acts like the mouth of the Don often and commands huge respect just like the Don. He is, however, not directly involved with the criminal enterprises of the Mafia. 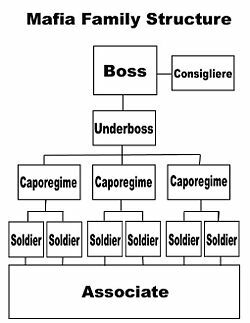 Below the Capo's are the made-men and soldiers. Made-men are the ultimate enforcers of the Family who have proved themselves and command respect from their fellow Mafioso. Soldier's are the lowest Mafia members. They do all the "dirty work" and as such are generally the ones arrested by the police. Soldiers command little respect and make relatively less money. The number of soldiers and made-men belonging to a Capo may vary tremendously. The Mafia also use Associates. Associates are not actual members of the mafia but are people involved with the criminal enterprises. The Mafia works through them. They may be drug-dealers, burglars, assassins, lawyers, or even police and politicians who are on the Mafia's payroll.